In this last episode of my shortest teaching stint, I want to begin with what is perhaps my biggest regret - before I pick up the thread of my tale of "culture shock" at ACJC. My sojourn at ACJC lasted for the duration of my one month's notice of resignation to the Singapore Ministry of Education ( MOE ). On my last day, 2 February 1978, I was presented with a 'Thank You' card, signed by about a dozen students who wanted to let me know that they appreciated my understanding and support for their situation as outsiders at ACJC. They were all non-ACSians - 'imports from other schools'. Alas I have lost or misplaced that precious card. I have searched for it, high and low, in Leicester and Kuala Lumpur but to no avail. However there was just one ACSian - a sweet, timid Chinese lass who assured me that she would see me before I left. A week before, she plucked up the courage to confide in me about how she had been regularly abused and raped by her businessman stepfather since she was 13. She could not talk to any one, not even her mother, and at 17 she wanted to expose and perhaps cauterize the pain. I listened to nearly 2 hours of tears and pain and anger from this gentle, fragile child as she relived all over again her years of agony and trauma. It was heartbreaking and all the more so because I could not do more to help - I had just about a week to be at hand for her and I was leaving Singapore almost immediately. I had no choice but to convey the case to the Senior Teacher or Class Tutor, just which one I could not remember. It seemed a breach of trust on my part, but she needed urgent professional help. I looked for her just before I left but she had been recorded as absent for a couple of days. As a retired teacher, I have had ( and still have ) misgivings and regrets about some of my students whose lives I have touched. My inability to minister to this tortured child, however, was my biggest frustration and failing. Other than the 'secular' flag-raising ceremony, it was normal for every school to conduct a weekly Assembly to inform and to publicise various activities in the school's calendar. In ACJC this took place on Monday mornings and I duly attended. I cannot remember the precise order of events. But I recall how all members of Staff stood in a row on the stage behind the Principal. Then each of us was given a book, and so were all the students in the Hall. I glanced at it and noted it was a book of Hymns and Prayers. Such a thing had never happened in all of my previous schools. I held my breath and waited. Then the Principal or the College's Chaplain gave a little religious homily. We were then instructed to turn the page to a particular Hymn. The Hall was filled with the sound of a Christian choir singing Christian Hymns. This was a Church Service, there can be no other explanation!! Those of us who were not pedigree ACSians and non-Christians were taken aback. I felt we had been ambushed. Again, no one from the MOE had informed the teachers and new students about this extra duty in this top-drawer Junior College. I closed the Hymn book and simply stood still. I glanced at my colleagues left and right. They were all singing away, including the Malay language teacher who I reckoned was employed by the College's Board of Governors. There was Amin, another teacher seconded to the College like me. We looked at each other. He was also doing what I was doing. Well, I attended Assembly the following week just in case it took on a different tone. It was exactly the same as the previous week. I did what I had done then and looked straight ahead across the rows of students standing and singing in that vast Hall. Suddenly, my eyes caught the eyes of an Indian sixth-form student - located almost in the middle of that 'Choir' - singing and holding the open Hymn book in his hands. Our eyes locked, almost transfixed in an odd empathy of our plight. A communion, you might say in Christian parlance. It was quite 'electric'. as people would describe it in today's electronic language. The student stopped singing, closed his Hymn book, and like me, he just stood still in attentive respect. It was uncanny, it was like magic!! I can feel goosepimples on my arms whenever I recall that spellbinding moment. Very, very unforgettable. And so I saw no point in attending Assembly/Services at all. I decided to stay in the Teachers' Room to do my marking. I was later called up by the Principal about the date of my departure and also to enquire about my lack of 'participation' during Assembly. He expressed concern about how this would affect discipline in the College. I simply told him that non-Christian students should not be subjected to Christian rituals especially as most of the new students were from government secular schools. I further added that such dispensation should include members of Staff too. He was glad to see the back of me and the feelings were mutual. 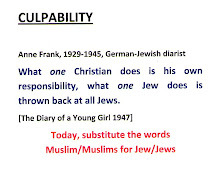 The moral is clear and this I emphasise with another little story. I wore a baju kurung on my first day at ACJC, and for most days I would be garbed in this or the baju kebaya. In the Common Room, a sweet Chinese lady teacher welcomed me and said, " You must be our new Malay language teacher." My late brother Akim was an accounts clerk at NOL ( Neptune Orient Lines) in the 1970s. He was not only the sole Malay in the Accounts Department but he was also good at his work. "Hey Akim, you must have Chinese blood in you aah?" said one of his colleagues who was attempting to pour scorn on Akim's ability to solve an accounting problem that he himself could not. My sharp-tongued brother retorted, "You are 100% Chinese, how come you cannot do what I can?" Just another AnaksiHamid! We go for the jugular. We don't take prisoners. This April has been the wettest since records began. Gone are our hopes for a splendid springy R & R in Leicester. So far, 2012 has not been an easy ride for some folks who are close to us, both young and old. The stress and strain of the 7 weeks' mission to Singapore had precipitated damage to the spouse's one good hip. Then on Friday 27 April he had to take an 11-hour journey by train and ferry to Jersey to see to his dying aunt, Joyce. Although he was two hours too late, he managed to 'see' her and to help arrange the details for her funeral. The return journey took longer as the ferry was delayed by three hours due to bad weather. Train travel was adversely affected by strike action. He was supposed to be home by Monday midnight but I had to wait until Tuesday afternoon when I opened the front door to a bedraggled man standing in the pouring rain - with an additional leg - a walking stick donated by Joyce's Rest Home! The trip to Jersey aggravated the damage and it sealed our worst fears. Another operation will be in the pipeline , we will have to be back in KL sooner than planned. Tung Shin Hospital, here we come. But I have managed to complete bits of my homework here like tidying the backshed, sorting out the paraphernalia in the kitchen, shopping at Animal Rescue Charity Shop, cataloguing my Files and Folders and Cuttings and clearing out the books and clothing to give away to the Charity Shops. I had cooked 3-star dinners for Jack, Dorothy and Ann and later on for Doug. Next week we will deliver 15 home-made samosas for Colin and his colleagues at Leicester University Central Photographic Unit for helping us out with an important printing task. We have re-connected with friends like Yasir and his wife Rafiah, Mr Kadri (our electrician) and his family and with Jagdish my young workmate from CPI days. The wonky central heating boiler, water heater and telephone land line have all been repaired. Phew!! As for Fish and Chips, that will have to wait for better weather. Time and tide they say, wait for no man. But during the interim, they also hurl unwelcomed sticks and stones into our space. As we have the benefit of being older and wiser (?) we have to put up with what is thrown at us and acknowledge life's uncertainties. We cannot assume that last year's birds will be back in the same nest. But Everything ends in songs. according to Pierre-Augustin Caron de Beaumarchais , 1793-99. This popular Italian tango Chitarra Romana or Roman Guitar, composed by Eldo di Lazzaro (1902-1968) has been sung by such well-known singers as Pavarotti, Placido Domingo and Connie Francis. But for me the best version is by Carlo Buti, recorded in 1934. Purple shadows are creeping and the fountain is weeping. Hear the trees gently sigh while the winds murmur by as they arrive from afar. Like the one who's forsaking, oh my Roman Guitar. This lovely tango takes me to the late 1980s when we were 'merayap-ing' along Arab Street, Singapore. 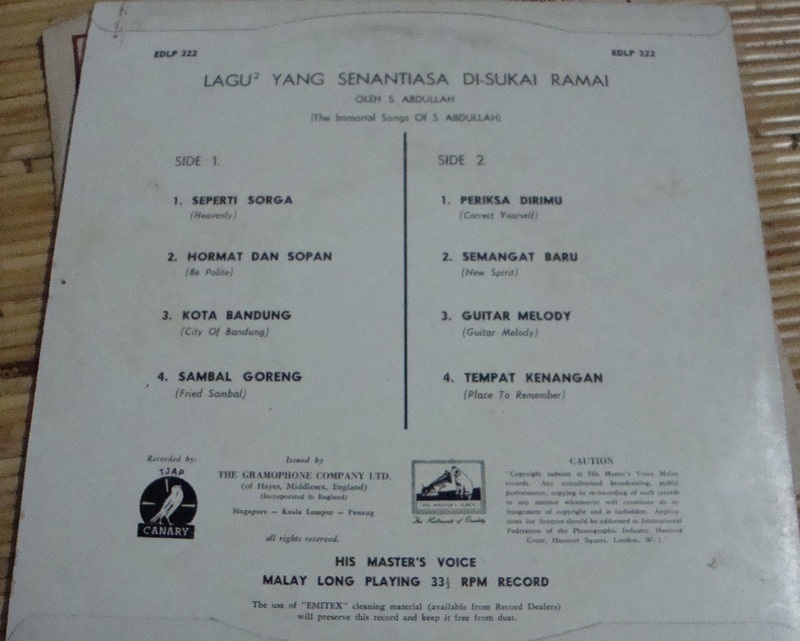 We found a shop displaying a box full of Malay songs on 10 inch long-playing records. These were mainly songs from the 1950s and 1960s. The Chinese shopkeeper was selling them at $2 per album and we bought the entire collection. Altogether there were three sets of eight albums. At that time I had a friend from Singapore University days who was working as a senior librarian at UKM. He was telling us how he had great difficulty in trying to enlarge the University's collection of Malay records. 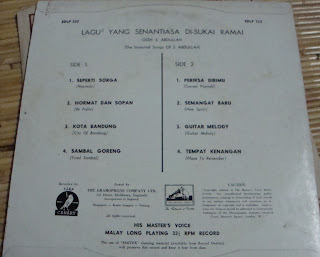 During one of his 'hunting' trips in Penang, he found one Malay 78 rpm record - dusty and badly marked with scratches. The shopkeeper wanted MYR10 to part with this one record! Hussein was over the moon when we gave him, for the Library, one set of those Malay albums. I often wonder if they are still in the Library. Here's one of those fabulous albums. 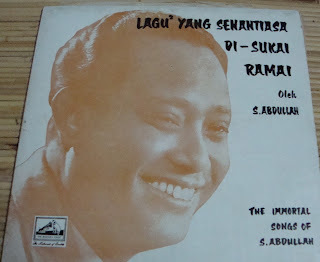 When we showed it to my mother, she informed us that S. Abdullah was quite a popular singer in the 1930s/1940s. (My mother was born in 1923). After more searching through his memory and the Internet he finally found the sister song, the Italian Chitarra Romana. That was another successful piece of musical sleuthing. I hope you will enjoy this beautiful melody from the 1930s/1940s - a meeting of East and West - from when most of us were just twinkles in our fathers' eyes. 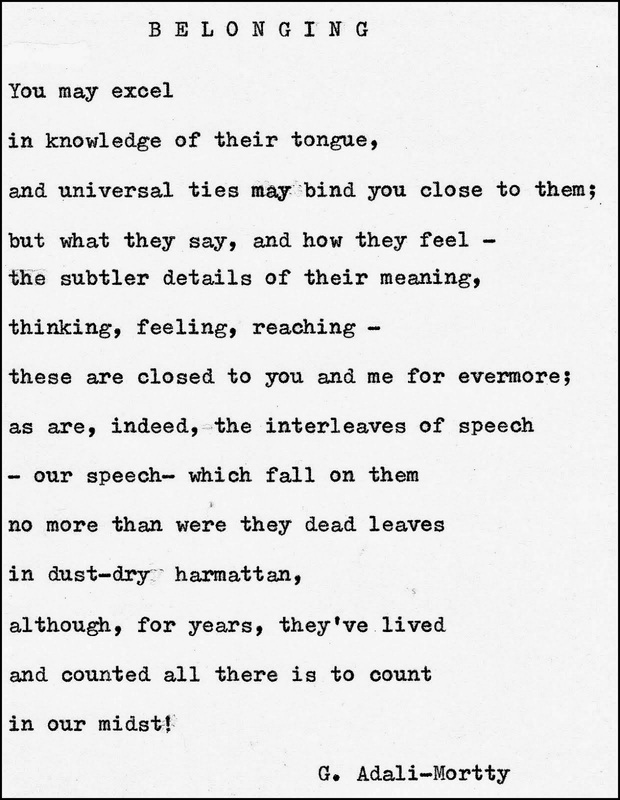 Never mind about this year's empty nest, we discovered a beautiful bird-song from the nests of a misty long, long ago.